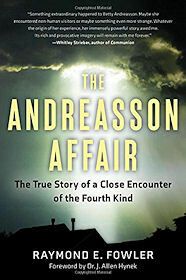 The Andreasson Affair has become one of the most celebrated, and challenging cases of alien abduction. The central event that is described in this book is the UFO encounter experienced by the Andreasson family in the town of South Ashburnham, Massachusetts, on 25th January 1967, and the subsequent Close Encounter of the Fourth Kind recalled by Betty Andreasson. This event contained many aspects which were hard to believe, and, on the face of it, difficult to reconcile with other similar experiences related by other experiencers at that time (more on this in a while). These included beings moving through walls, floating through the air, and using telepathic communication, including mind control. Some of these have become fairly standard fayre within reports of more modern CE-IVs, but were highly unusual back in the 60s and 70s. Then there were the more profoundly bizarre aspects of this case, which remain contentious to this day. Yet, despite its high strangeness, the case has become one of the centrally important investigations to have been documented - not least because of the extensive and in-depth study carried out by investigators from CUFOS in 1977 (including the author, Raymond Fowler). The initial investigation took 12 months to complete, culminating in a 528 page confidential report. It involved professional hypnotic regression of Betty, as well as her daughter Becky, at the New England Institute of Hypnosis in the summer of 1977, some ten years after the actual event had taken place. These sessions provided a dramatic, often startling recollection of the abduction event. A high level of trauma, both physical and mental, was inflicted upon Betty by her alien captors. She was keen to get to the bottom of the experiences, and underwent the hypnosis willingly - but the traumatic nature of the experiences meant that the sessions had to be handled highly professionally and with great care. The book contains a chronological sequence of recalled events, carefully reconstructed from information gathered over a number of regression sessions. It overlays information gathered from later sessions where more in-depth and detailed recall could be obtained. During hypnosis, Betty alternated between participant and observer, varying her involvement according to the degree of terror she experienced at any one time. Many of the events she recalls (and relives through hypnosis) are deeply disturbing, even to readers accustomed to the 'normal' horrors of alien abduction. For instance, Betty describes being immersed within a container of strange fluid during some kind of inter-planetary travel sequence. She had to breathe through tubes placed into her nose, and was given some kind of fluid to drink which calmed her obvious terror. Was this bizarre and horrific sequence a means of protecting the human body during interstellar/interdimensional travel? If so, why not simply sedate the abductee completely, to offset the self-evident terror that was bound to be experienced by a sentient being? What kind of creatures are these? Other events are surreal, dream-like, and frankly, out of place within the context of what most consider to be a 'classic' alien encounter. During the sequence that appears to take place on an alien planet/alternative dimensional realm, Betty is brought to a 15' high Phoenix, which emerges from a zone of painfully intense heat. The experience took on some profoundly religious overtones, culminating in an epiphany (albeit a rather bizarre one). This raises questions among the investigators about whether these alien experiences are filtered through pre-existing social and religious mental frameworks, and reformed in a context which the individual relates to and takes comfort from. I guess the late Dr John Mack might have called this a screen memory, where a false memory takes the place of a repressed, traumatic memory, usually from childhood. One might argue that the entire alien abduction sequence falls into such a category; were it not for corroborating evidence in this case from other family witnesses. What is real here, if anything at all? The surreal and quasi-religious aspects of this case simultaneously call the case into question (from the context of a nuts-and-bolts UFO/CE-IV encounter) but also give the case some traction as a truly 'alien' experience. Another aspect of the case which is odd is the alleged retention of a gift from the aliens - a 'blue book' full of "glowing pages" which remained in Betty's possession in her house for a couple of weeks after the event, before mysteriously disappearing. The recollection of this aspect of the case took place in 1977, many years after the 'Project Blue Book' investigation by the US Air Force, the nomenclature of which may have been a factor. I found it intriguing that this book had glowing pages. Back in 1977, this would make no sense. But with today's technology, it has some relatable context - paper-thin bendable screen technology, perhaps, which seems quite possible as emergent technology in the years ahead. The author makes a good job of drawing together contemporary UFO/abduction reports to draw similarities with this one. He also alludes to other unpublished cases known to the CUFOS researchers at the time containing similarly bizarre aspects, which, to him, provide confirmatory evidence of commonality between all these cases. I wonder why this 2015 re-issue of the original 1979 book did not now include detailed documentation of these commonalities? After all, 35 years on there seems no harm in divulging such crucial evidence, given the plethora of abduction cases that have emerged over the last few decades, and the debris-field of CE-IV accounts strewn across the Internet. Even the secrecy-obsessed British Government has a 30-year rule over information declassification. Why should Ufology keep its secrets beyond this period? In trying to assess the truthfulness of these crucial, historical cases, we need all the corroborating information we can get. But, then, there is not that much of a sceptical approach evident among the investigators of 'The Andreasson Affair'. Perhaps that reflected the empathy they must have felt towards the clearly-traumatised young woman in their care. But I would have liked to have seen some more questioning of the accounts in the book's analytical sections. For instance: It's now recognised that a certain type of mould growing in houses can cause hallucinations; the psychoactive influence of Claviceps purpurea has been associated with the historic Salem witch trials, for instance. Similarly, recent work on reputedly haunted houses has looked at the influence of the indoor airborne mould Stachybotrys charatarum. Given that this case took place in the depths of winter; that a fearful encounter was experienced be several family members simultaneously; and given the descriptions of the living conditions in the extended family dwelling provided, it seems possible that such a scenario could be at play here. The investigators may not have been aware of such possibilities back in 1977, but inclusion of these possible causal factors would have been welcome in this 2015 re-issue which, in others respects, included many timely updates (especially regarding the availability of subsequent follow-up books on the case). That said, later chapters in the book describe the catalogue of other abduction events experienced by Betty, her daughter Becky and her second husband. Betty also experienced a dreadful premonition prior to the tragic death of two of her sons in a road accident (p222). None of these factors lend themselves to an explanation involving hallucinogenic house mould, particularly as the family moved around the U.S. a fair bit. Betty has publicly stuck to her story for decades, also lending credence to her account of her alien abduction experience over time. I can see why this case has become so important over the years. Reading it with the hindsight of 30-40 years of subsequent Ufology, this CE-IV broke new ground at the time, much of it corroborated by later cases. The book succinctly and intelligently weaves together aspects of the case gleaned from various hypnosis sessions, providing a highly readable, chronological account of the horrors experienced by Betty Andreasson and her family that fateful night in 1967. Subtitled "The True Story of a Close Encounter of the Fourth Kind"